During World Health Worker Week, frontline health workers and members of the Frontline Health Workers Coalition (FHWC) took to Capitol Hill in Washington, DC, to educate lawmakers and their staff on the tremendous impact frontline health workers have in their communities and advocate for greater and more strategic investment in frontline health worker teams around the world to meet global health targets. Investment in frontline health workers—particularly in low- and middle-income countries with the least access to essential health services—can save more lives, jumpstart economic growth (especially among women) and ensure global health security. It’s a win-win-win! A team of our coalition advocates pauses in the hall outside Rep. David Trone’s office. 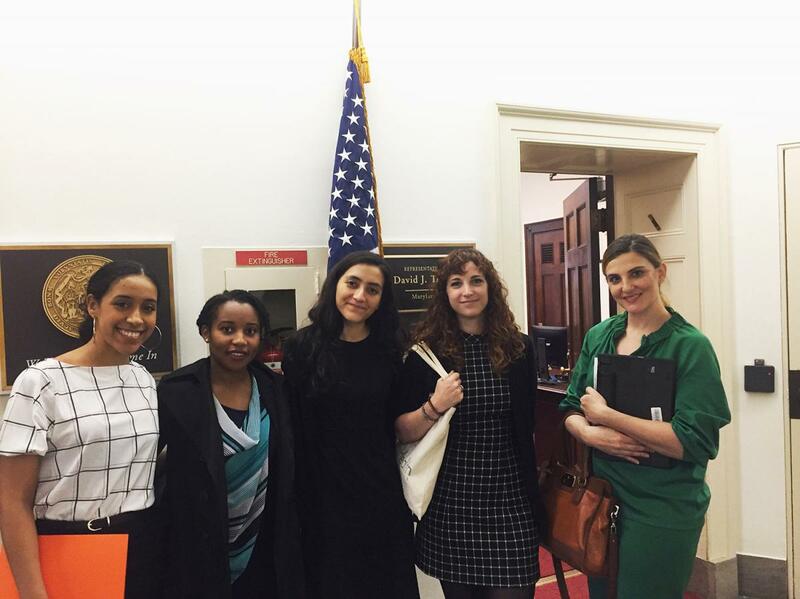 FHWC members and frontline health workers and advocates held meetings with nine US Congressional offices—sharing our recommendations for US Congress on frontline health workers in the Global Health Council’s new Guide to US Investments in Global Health. Left to right: Sarah Kashef, an IntraHealth International-Global Health Corps fellow on the FHWC Secretariat; Niniola Soleye, Managing Director of DRASA (Dr. Ameyo Stella Adadevoh) HealthTrust based in Nigeria; Victoria Rodriguez of Global Health Council; Sam Rick of IntraHealth and FHWC’s deputy director; and Jill Carney of Save the Children. It’s a gorgeous day to advocate on the Hill. The sun’s out, and so are the DC cherry blossoms—and our advocates. FHWC advocates for policymakers to hear directly from and listen to the voices of frontline health workers from around the world. 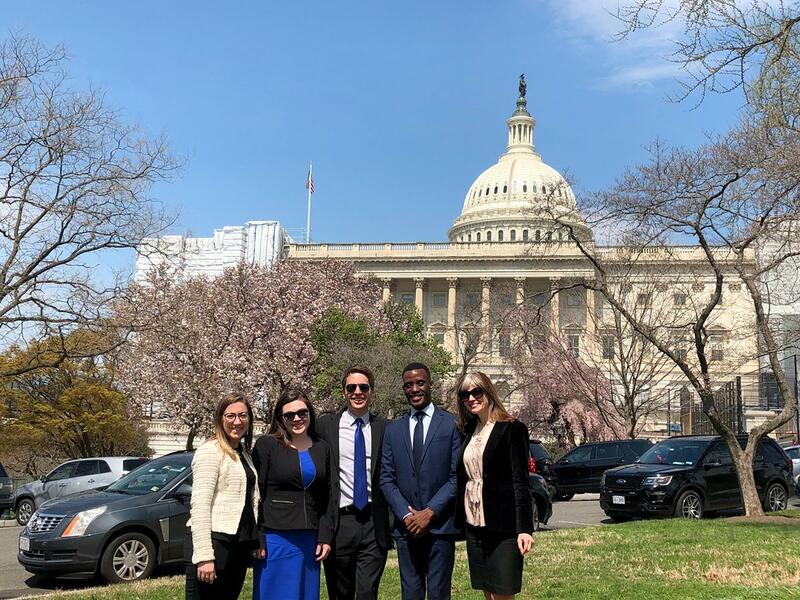 Munashe Nykia (second from right), shared with lawmakers and staff his experiences working as a nurse in Harare, Zimbabwe. Left to right: Amanda Medlock of World Vision; Brittany Evans of IntraHealth and the FHWC Secretariat; Vince Blaser, director of the FHWC and senior policy and advocacy advisor at IntraHealth; Munashe Nykia, nurse and nursing advocate from Zimbabwe and NursingNow board member; and Carol Bales of IntraHealth and the FHWC Secretariat. After the office visits are finished, FHWC Director Vince Blaser kicks off our reception. 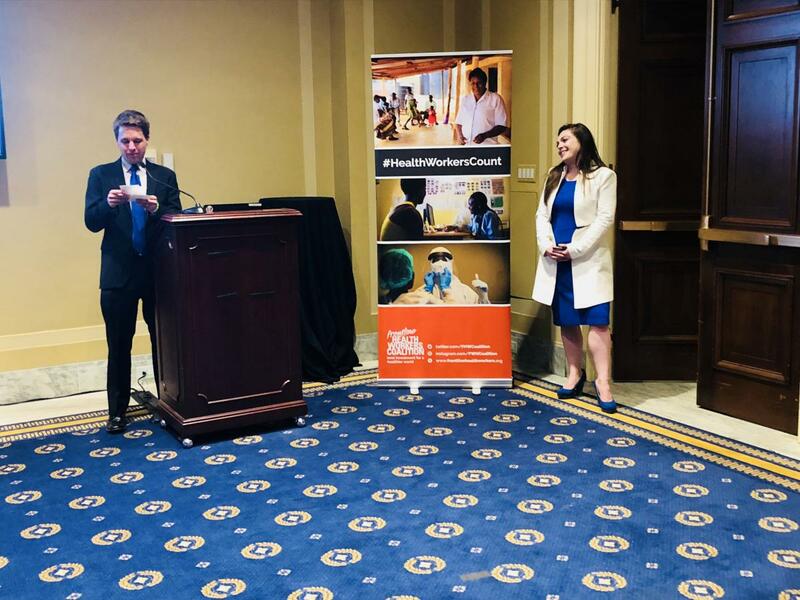 “We’re here to highlight the importance of bipartisan US leadership to ensure the health workforces needed around the world deliver self-reliant progress in global health,” Blaser said. 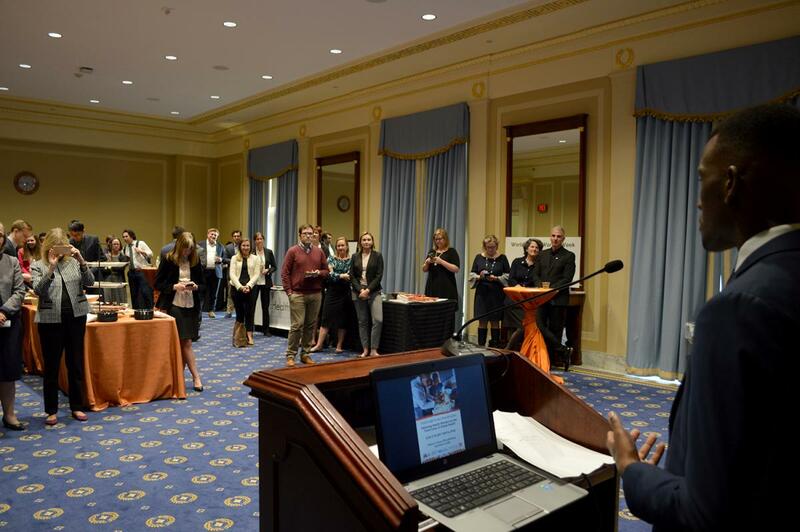 There were nearly 100 people at our reception, including 52 Congressional staffers! Thanks to cosponsors Elizabeth Glaser Pediatric AIDS Foundation, IntraHealth International, International Medical Corps, and JSI. 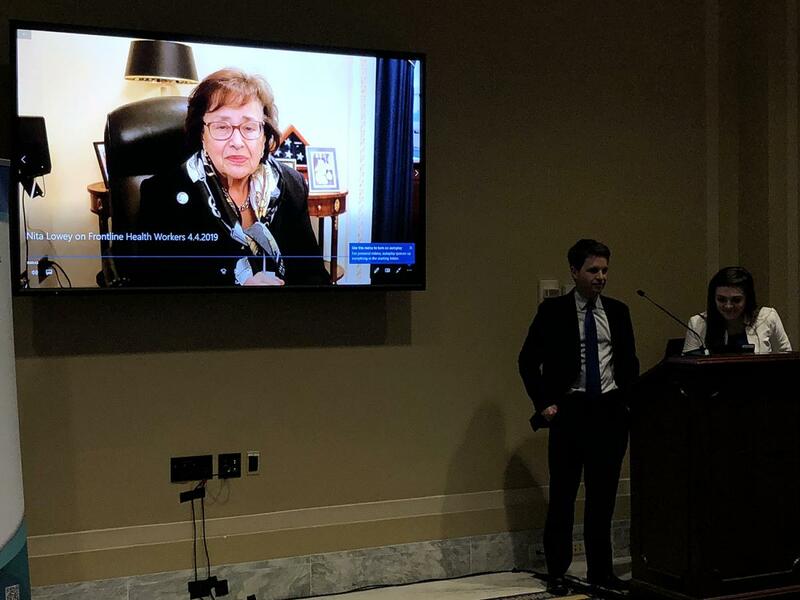 Rep. Nita Lowey, a long-time global health and frontline health workforce champion delivers welcoming remarks from afar. 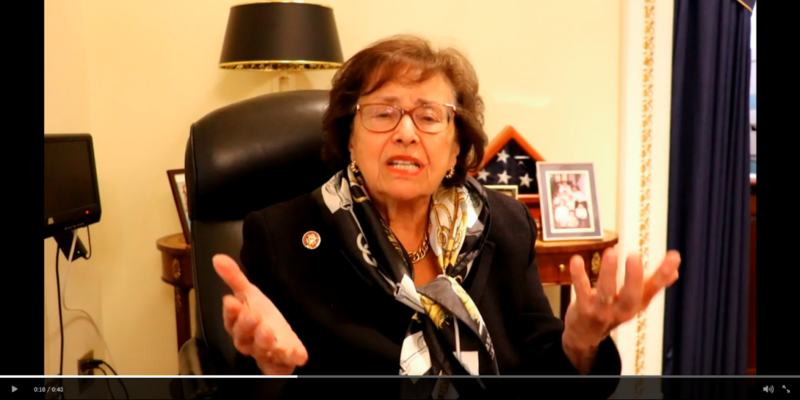 Rep. Lowey speaks directly to frontline health workers around the world, congratulating them on the lives they’ve saved. Niniola Soleye, founder of DRASA Health Trust, highlights the bravery of frontline health workers, like her aunt, Dr. Ameyo Stella Adadevoh, and how many risk their lives to keep us healthy and safe. Dr. Adadevoh detected the first case of Ebola in Nigeria—the most populous country in Africa— during the West Africa outbreak in 2014 and was able to contain the virus before it spread. Sadly, she and three other local health workers died from the virus. Nigeria’s health system and health workforce was not prepared for an outbreak. But Dr. Adadevoh’s swift actions to diagnose and quarantine the person with Ebola helped save countless lives by preventing the virus from spreading in the country with more than 190 million people. 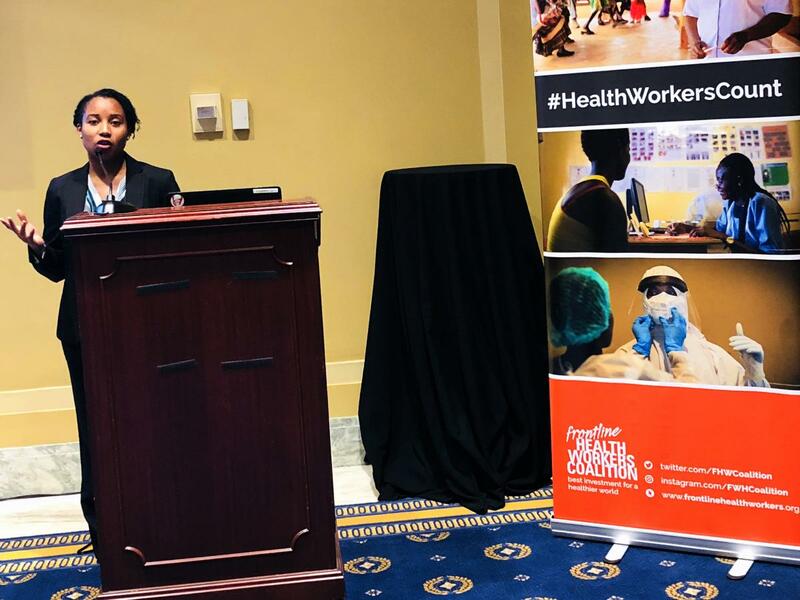 “DRASA Health Trust is now honoring my aunt by improving the health workforce in Nigeria, which we believe is critical for global health security and progress across health issues.” said Soleye. 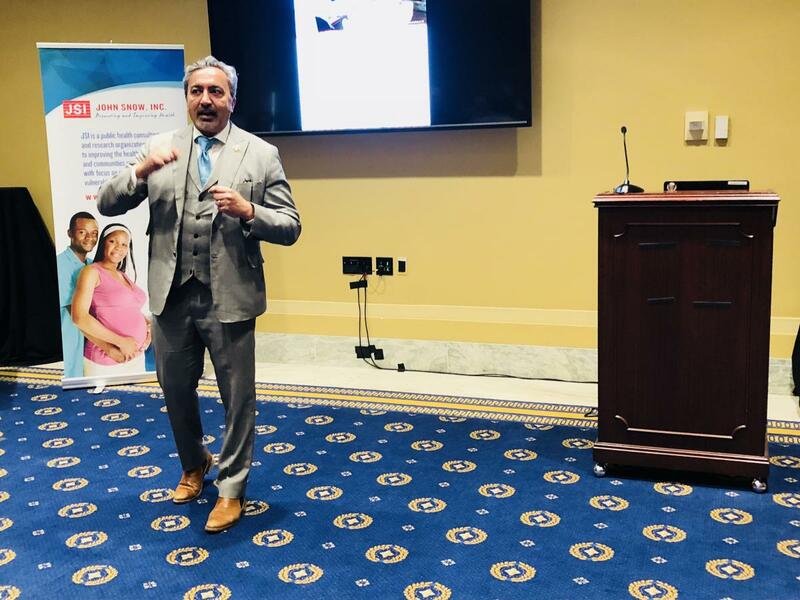 “The best way we can honor health workers is to build their capacity,” said Rep. Ami Bera, also a medical doctor for more than 20 years. 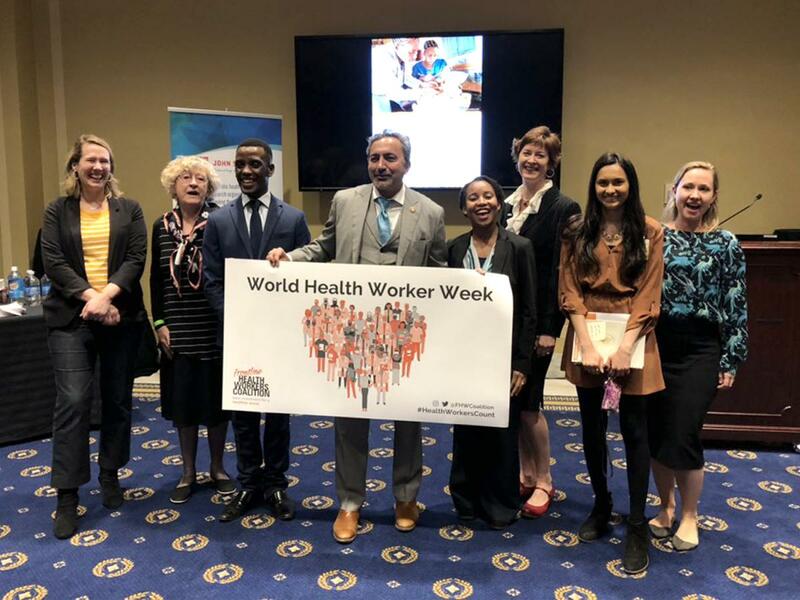 Rep. Bera is a champion of global health and the global health workforce. He shared his unique perspective on the heroic efforts of frontline health workers around the world—from saving mom and baby lives to fighting infectious diseases. Thank you to everyone who advocates or champions policies and investments to ensure frontline health workers around the world have the training, skills, supplies, and protection they need so they can save lives, enable prosperity, and ensure global health security! Look at all these health workers at the event! Health workers are all around us and some are also advocates! Health workers can also be changemakers locally, nationally, and globally! 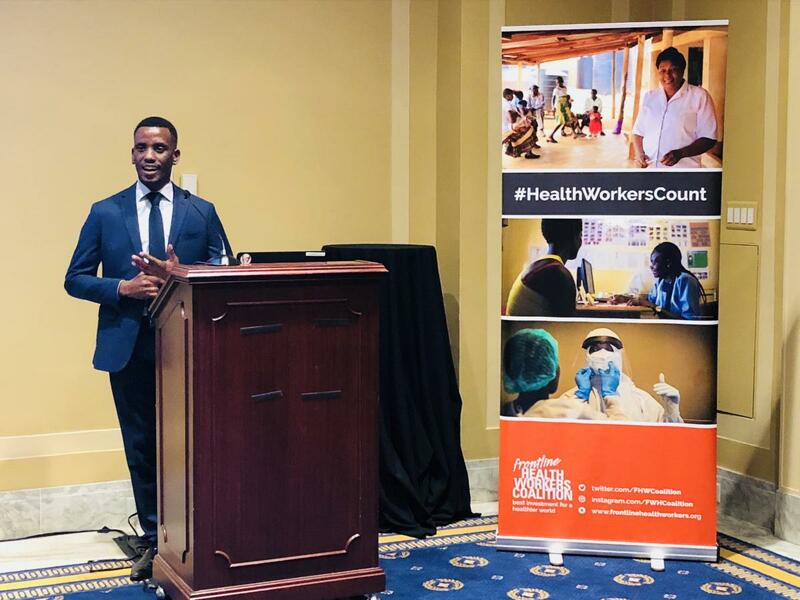 From members of Congress to those on the front lines, the FHWC is working to ensure the voices of frontline health workers are heard by global health policymakers and influencers. 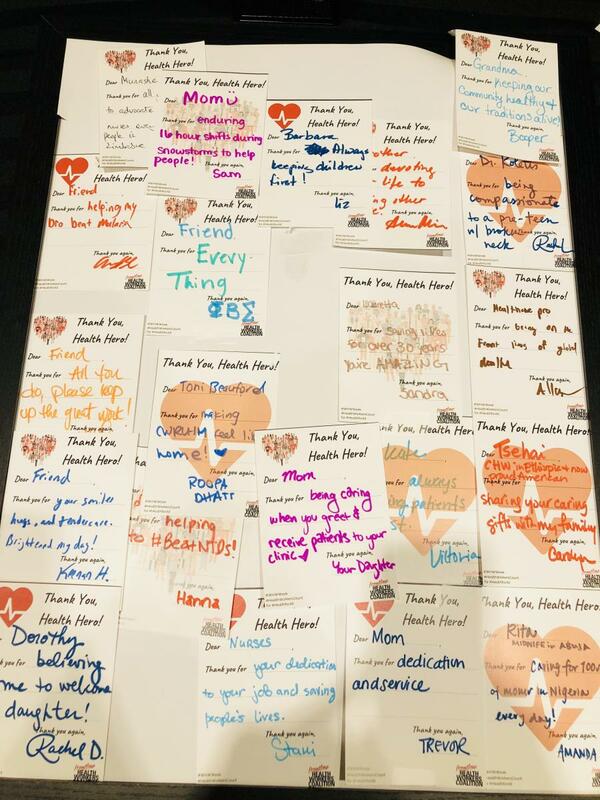 In between speakers, participants write heartfelt thank you notes to health workers. 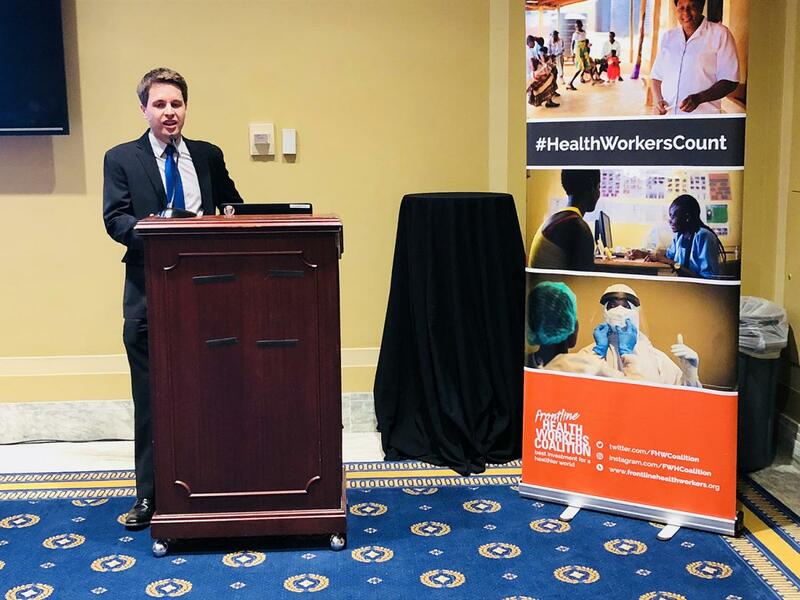 One of our key themes for World Health Worker Week was the need to recognize the roles and contributions of different types of frontline health workers—from community health workers to doctors—toward health for all. Thank you for enduring 16 hour shifts during snow storms to help people! 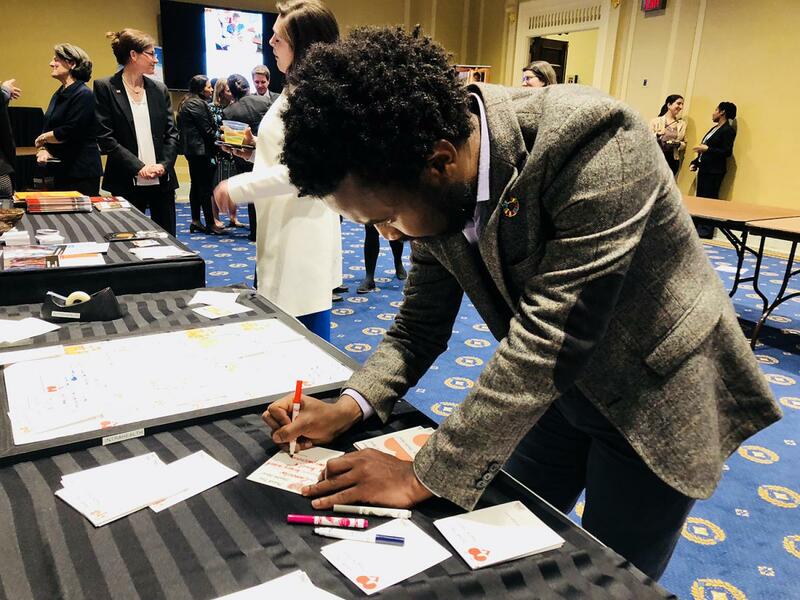 Many advocates and staffers at the reception dedicated thank you cards to close friends and family members, and lots to “Mom.” It reminded us that we all know a health worker, and that most health workers around the globe are women. Vince Blaser read several of the thank you notes, pointing out that the majority of health workers are women and we should empower them to reach their full potential. Although women make up 70% of the health workforce, they only hold 25% of leadership positions. The majority women health workers are in lower status, low paid roles, and often working in insecure conditions. Melissa Sharer of JSI shares her own experience as a frontline health worker and notes that investing in the health workforce strongly contributes to women’s economic and social empowerment! 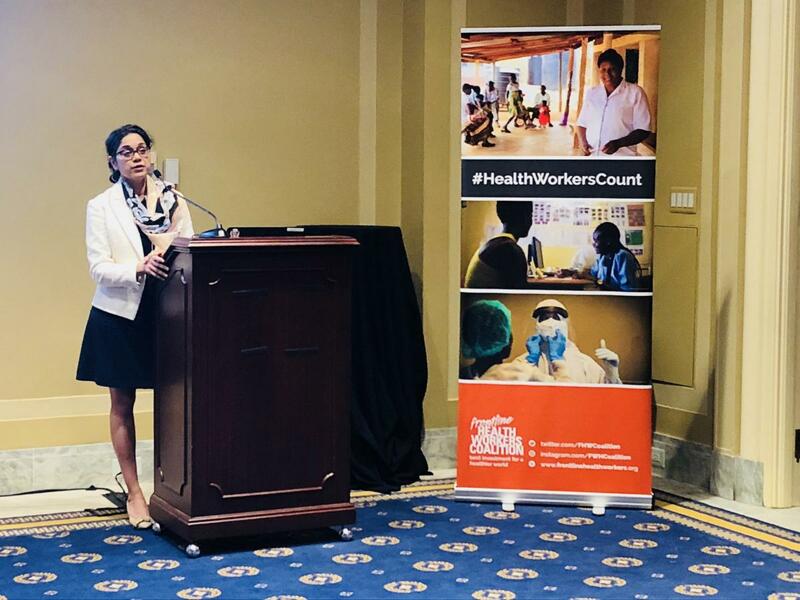 Dr. Angeli Achrekar of the US President’s Emergency Plan for AIDS Relief (PEPFAR) provides hard stats to show how investment in health workers is saving lives around the world. Helped 2.4 million babies be born HIV free. “We need to make sure the health system is strong to support health care workers,” says Irene Koek of USAID. Munashe Nykia, young nurse, advocate, and board member for NursingNow, closes our reception. Use all our voices to push for health for all! 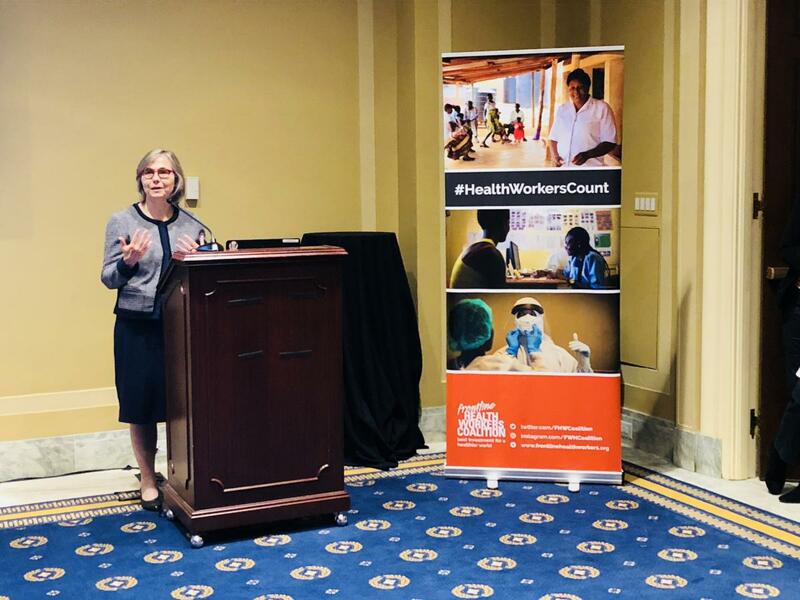 Going forward, we hope frontline health workers, policymakers, and and advocates will continue to push for better and more strategic investment in frontline health workforce teams in communities of least access worldwide! 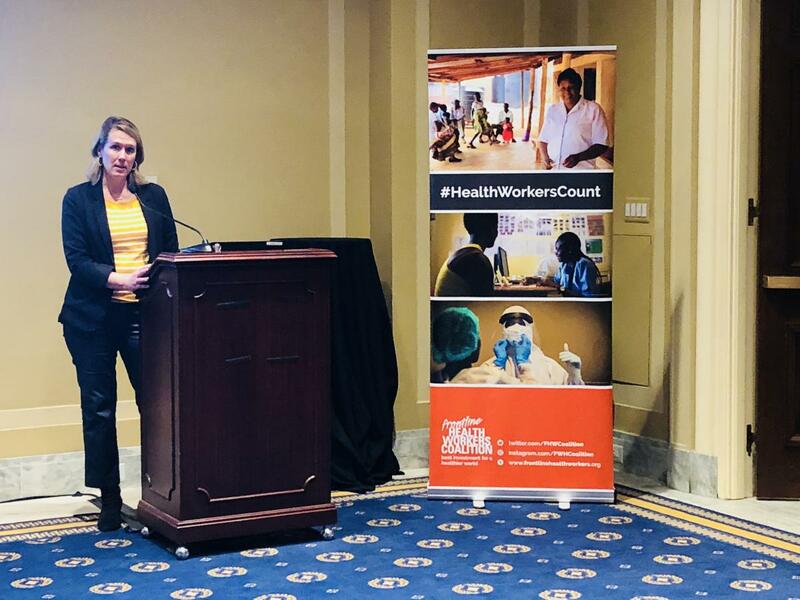 Follow ongoing efforts using #HealthWorkersCount on Twitter and Instagram. Snapshots by Carol Bales, Sarah Kashef, Sam Rick, and Jessica Turner for the Frontline Health Workers Coalition and IntraHealth International.